ABUJA- National Chairman of the Peoples Democratic Party, PDP, Prince Uche Secondus has described Wednesday defection of Senator Godswill Akpabio to the All Progressives Congress (APC) as unfortunate, saying the lawmaker has by the move, elected to work against his people. Secondus said he finds very strange that Akpabio would team up with the ruling party at a time its chieftains were trooping into the fold of the PDP. A statement by signed by his media adviser, Ike Abonyi quoted Secondus as saying whatever caused Akpabio’s action must have been for self preservation and not borne out of any rational strategic political decision. 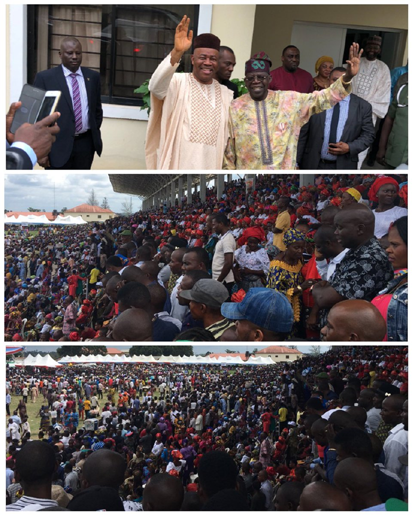 He stated that the lawmaker’s decision does not enjoy the blessing of the people of Akwa Ibom whose mandate he enjoyed for eight years as state governor and nearly four years “now” as a senator. The statement read: “I cannot fathom any reason on earth Senator Akpabio should work against the tide, moving at opposite direction to a place every reasonable persons are escaping from. “He deserves our pity because whatever would make somebody to chose bad for good is clearly one that he should be prayed for, for salvation especially given the fact that wolves are waiting for his arrival to devour him. “How on earth can anybody who has his eyes wide open be seen walking into danger knowingly?,” he asked. ” I urge you to remain focused and continue to give support to your hard working governor, Emmanuel Udom as he remains unrelenting in the delivering of democracy dividends to the people,” the statement added. Previous articleLa carrera docente: ¿ Qué está haciendo bien la República Dominicana?